Milling is a machining process that is widely used in the furniture industry, since a good quality surface finish is essential. Produced MDF parts usually have aesthetic importance that is affected by poor surface finish and chipping of the melamine layer that may occur during machining. In addition, higher surface roughness affects the quality required for the subsequent assembly processes because the adhesion between the part and the edge tape decreases. Despite this, there are few specific studies focused on finishing MDF milling process using CNC woodworking machines. 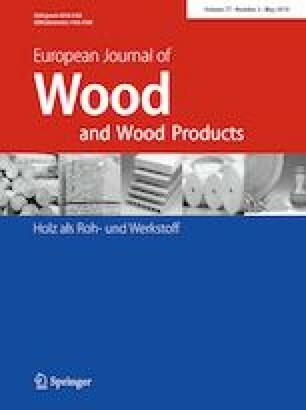 Thus, an evaluation of the surface finish generated by peripheral milling of melamine-coated 15 mm thick MDF panels was carried out. The 2k factorial DOE was performed varying cutting speed, feed rate, and cutting motion. Four different tools were tested with different helix angles and number of teeth. The surface finish was evaluated through the measurement of the average roughness (Ra), while the chipping of the melamine edges was qualitatively evaluated. Among the main parameters, feed rate, tool helix angle and cutting motion showed a significant influence on Ra. However, the most significant influence was observed for the interaction between the number of teeth and the helix angle. Moreover, the 30° helix angle is mainly responsible for the melamine layer chipping, although the number of teeth indirectly affected the incidence of chipping. Based on the results, the end mill C-type (10° helix angle and 3 teeth) in the up milling with 2.7 m min−1 feed rate was the best combination.